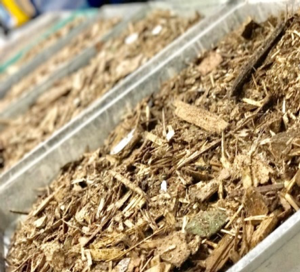 Biomass is a name for a broad variety of materials coming from either virgin origin or waste and recycling industries. Biomass coming from virgin origin are for example woodchips and wood pellets. Biomass coming from waste and recycling industry is mainly treated wood in different grades. All over the world more and more of the energy necessity is supplied by biomass conversion. Handling biomass leads to dust emissions. Prolonged or repeated exposure to fine biomass dusts has an effect the workers’ health: biomass dust is a human carcinogen*). Dust emission can travel for miles and possibly effect the direct surrounding and community. Besides the impact on the direct surroundings, a lot of biomass is lost during handling. Foaming is a technique used for inline treatment with increased active duration up to 30 days, which allows minimized water usage and moisture levels. Applied with compressed air a very dry and thick foam curtain can be created. Wuvio’s wetting agent allows for hopper loading to be done with up to 75% less water and with reduced dust emissions.